Matthew Green, Hamilton's first black councillor, discusses being questioned by Hamilton police and how the interaction left him feeling embarrassed, frustrated and angry. Coun. Matthew Green said Wednesday morning being questioned by Hamilton Police while waiting for the bus on Tuesday left him feeling frustrated, embarrassed and angry. "He repeatedly questioned my credibility, acting in an intimidating manner and continued to harass me even though it was clear I was not a suspect in any crime nor involved in criminal activity," Green wrote in a formal complaint he sent to the Hamilton Police Service on Wednesday. He shared a copy with CBC Hamilton, taking out the officer's name. "I feel what he was doing was unlawful and unconstitutional," Green said. While Green said he doesn't know what the officer was thinking, he feels he was approached and questioned because he is black. He posted a tweet about the interaction on Tuesday, suggesting that the news of the "carding" tactic's end in Hamilton has been premature. Green also shared details of his interaction in a conversation with CBC Radio's Matt Galloway on Metro Morning on Wednesday (You can hear that interview by clicking on the Listen button at the top of the story). "It was humiliating in a way, but more frustrating," he said. Hamilton Police Service spokeswoman Catherine Martin said that any member of the community who has a concern or complaint about a member of the service or the way policing is delivered can file a formal complaint through the Office of Independent Police Review Director. "We cannot and will not provide any comment in order to ensure the integrity of that process," she said. Green was waiting for the bus at the southeastern corner of Stinson Street and Victoria Avenue South around 3 p.m. on Tuesday. It was about 4 degrees Celsius and windy on Tuesday afternoon. He was wearing a blazer, collared shirt and casual pants, he said, and was underdressed for the weather. He decided to cross the street while he waited for the eastbound bus, to stand beside the bridge next to the Central Memorial Recreation Centre "in order to shield myself from the frigid wind and wait for the Eastbound 5 Delaware bus." Two police squad cars drove out of the rec centre lot and pulled up to where Green was standing, checking emails on his phone. The officer in that car lowered his window and asked Green what he was doing. Officer: "What are you doing there?" Green: "Out of the wind waiting for the bus." Green said the officer's questioning and tone "became more agitated" and cars were starting to line up behind him. The officer asked where Green was going. "Recognizing the nature of his questioning and feeling harassed, I believe I replied, 'Why does that matter?'" Green said. Officer: "The bus won't be able to see you." Green said he looked to the officer's partner, waiting behind him in another car. The partner told Green, "Tell him he's holding up traffic." Green said that to the first officer. Green said he asked if the officer would like to pull over to continue the conversation. Officer: "No, I'm good here. Are you from this city?" Green: "Yes, I'm very much from this city, and you?" The officer asked for his name "in an annoyed tone," Green said. Green: "Matthew Green, and what's your name?" The officer said his name, which Green took out of the version of events he sent to media. Officer: "Are you the city councillor?" Green said he did not respond, and looked to the officer's partner. He said he hoped that would end the interaction. But the questioning officer started asking repeatedly, "Are you OK?" Green said he doesn't think the officer was asking out of genuine concern for his wellbeing or safety. 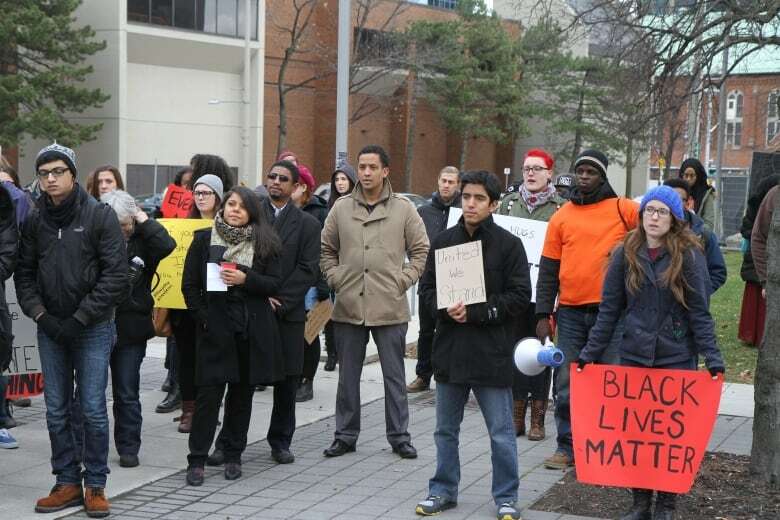 "The conversation felt confrontational," he said. "I was made to justify my existence in my own community." On Metro Morning, Green emphasized that the police officer did not ask Green to show identification, though he did ask for his name. "I know how I was feeling in that particular moment. I don't know how he was thinking. And I certainly don't know why I was made to feel like a suspect in my own neighbourhood," Green said. 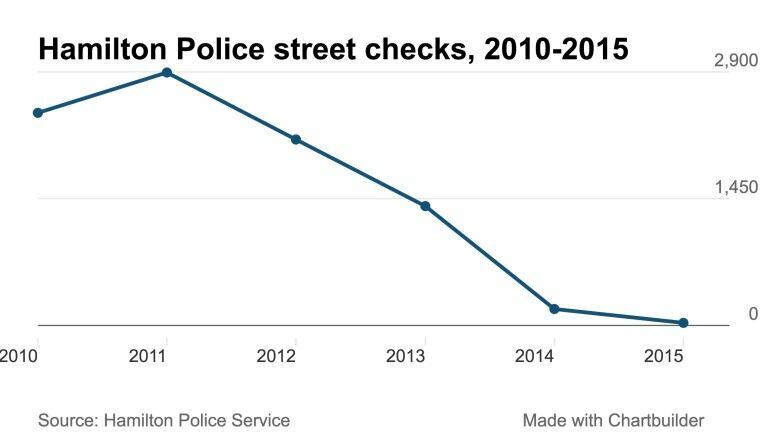 Statistics released by Hamilton police show that street checks or carding disproportionately targets visible minorities. The service has defended the controversial policing tool saying there would be dire consequences for Hamilton safety should the practice be limited. But the latest carding numbers, obtained by CBC Hamilton through a Freedom of Information request, revealed the number has dropped dramatically from hundreds and thousands in previous years to just 30 in 2015. Hamilton Police acting Chief Ken Weatherill told CBC Hamilton in an interview last week that police say they haven't directed front-line officers to stop the practice, but they are not concerned about the drop. "We are encouraging our officers, as much as we ever have in the past, to interact with their community," he said last week. "Speak with them, relate with them, work with them to keep the street safe." How does that drop jibe with the interaction the officers had with Green? "It might be the case that they've gotten rid of the actual cards," Green said. Galloway asked Green if he thinks he was stopped because he's black. "I feel that way," Green said. "I can't impugn his motives. I don't know what the officer was thinking." Green said he doesn't know if someone in the neighbourhood saw him and was suspicious and called the police. Canadian Charter rights allow people to walk away from voluntary interactions with police. "Did that cross your mind?" Galloway asked. "Absolutely not, no," Green said. "In theory my Charter rights allow me to walk away. I know in that particular situation it was somewhat of a psychological detainment." The officer was "obviously in control enough" of the situation that he was content holding up a handful of cars to have the conversation, Green said. "As an elected official, you know, I wanted to try to cooperate with him and answer the questions as fully as I possibly could, and I think walking away at that time would've escalated the situation," Green said. 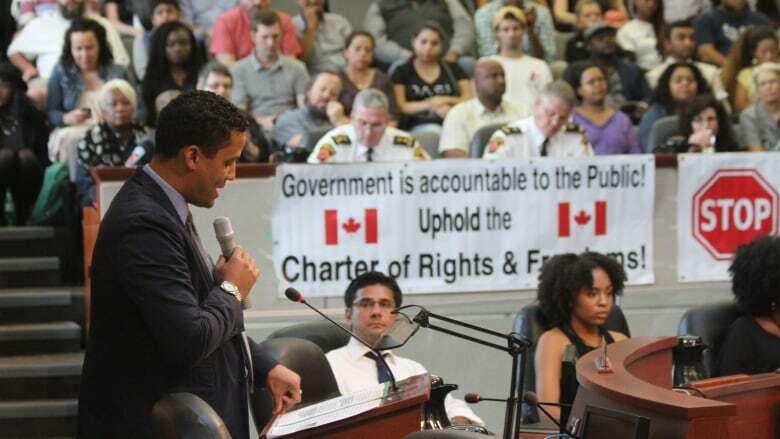 <a href="https://twitter.com/MGreenWard3">@MGreenWard3</a> is talking to ppl not a part of policing? Is that not what beat cops do? HPS have their hands tied, let them do their job. "What is their job?" he said. "And who do they serve? So my question is, 'What does a criminal look like?' There's a lot loaded in that statement in terms of what people expect." Green said the fact that the interaction happened in the middle of the afternoon, while he was dressed in business casual wear, challenges the frequent police narrative that carding-type conversations happen "at 3 a.m. in a dark alley." "You know what, Matt – this was 3 p.m. in broad daylight on a busy street," Green said. Green said that interactions like this have happened to him before. "It has, but certainly not as an elected official," he said. "I was certainly surprised – but not surprised. This happens to thousands of people across the province; statistically, we know this is going on."